Pammy Blogs Beauty: No 4 High Performance Hair Care: Lumiere d'hiver Reconstructing Masque: For a Great Hair Day! No 4 High Performance Hair Care: Lumiere d'hiver Reconstructing Masque: For a Great Hair Day! We all deserve Good Hair Days, right?!?! I know that having a Good Hair Day always gets you started on the right track. Well, that's where this gem of a Hair Masque comes in. 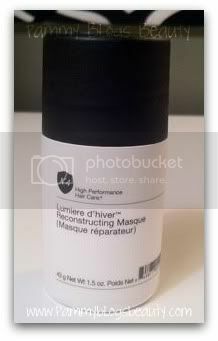 This review is for the Lumiere d'hiver Reconstructing Masque from No 4 High Performance Hair Care. I was absolutely thrilled to get this high-end deluxe sample in my Birchbox a few months back. My hair is so dry! It is normal-dry and the ends are super dry. It is very long and heavily highlighted. I rely heavily on very thick and rich hair products to keep my hair looking smooth, shiny, and healthy. But, I am picky! I don't want any products that weigh my hair down nor make it look greasy. While my hair is very thick and long, it is fine in texture and straight. Honestly, many conditioners that I try just don't provide enough moisture. I need mega-moisture from my hair products. How did I like Lumiere d'hiver Reconstructing Masque? Wow ya'll, this masque is just fabulous!!! It is everything that I am looking for in a hair conditioning treatment! It moisturizes hair and leaves it feeling soft and smooth. It moisturizes without weighing hair down. Actually, my hair is always very bouncy and easy to style after using this wonderful product! I am absolutely thrilled with the results! The sample size that I got from Birchbox was 1.5 oz. I was able to get 3 uses out of this sample. But, my hair is very long. Most people could probably get 4 uses out of a sample of this size. I wash my hair as normal and rinse. Then I apply this Masque to my wet hair while I am in the shower. I comb it through with a wide tooth shower comb. I leave it on for about 5 minutes (Directions on bottle say 2-5 mins). Then I rinse out. I love this products unique scent! It has a "classy" type perfume scent. I am so used to using hair products that either smell like fruit or smell "woodsy" (I use a lot of Aveda). So, this sophisticated scent was a nice switch from my usual. This product works by using a combo of moisture and protein to infuse your hair with what it needs (Well, that is what my hair needs for sure!) . Available at Birchbox.com for $58 for a 5.1 oz bottle. Whew, steep price. But, it works great! There is no question: I love the results of this hair masque! Not only does it moisturize and smooth my hair, but it also makes styling a breeze. My hair looks bouncy and shiny and smooth when I use this product. A guaranteed good hair day for me! Actually, I almost wish that I didn't like it so much as it is an expensive product. But, alas, it looks like this will be a re-purchase for me in the future! Good hair care is an investment! Why spend money on good highlights if you are not going to take great care of your hair. Yes, I know, there are many great and inexpensive conditioners out there. But, if you want to splurge on a very nice hair masque, this one by Number 4 High Performance Hair Care is a great option for you! my paid subscription to Birchbox. hey, i'm trying to figure out whether this is worth splurging on but all of the reviews are from people with fine and oily hair. mine is coarse, thick and brittle/heat damaged. any idea whether it'd be useful for someone like me? thanks!